This is the first in a five-part series chronicling the history of Pro Tools from the very start of Digidesign all the way up to the present day with the release of Pro Tools 2018.1... In this article, we look at how Pro Tools came about through to release of Pro Tools 2 in 1993. The history of Pro Tools goes all the way back to 1983 with the release of E-MU's Drumulator drum machine. It was a companion to the Emulator sampling keyboard and the Drumulator was a relatively simple digital unit with EPROM- based memory for its non-editable 12-bit samples. The Drumulator was a success despite the limited built-in sounds. Evan Brooks and Peter Gotcher, who were high school friends and both graduated from the University of California had a shared interest in music, recording, electronic engineering and computer programming. Evan and Peter, saw an opportunity and set about creating new sound libraries for the Drumulator and set up Digidrums, and offered upgrade EPROM microchips a year after the release of the E-MU drum machine. You can watch a video from the NAMM oral history library in which Digidesign co-founder Peter Gotcher who played drums in a band with Digidesign co-founder Evan Brooks and they both became interested in creating electronics to change sounds. One of the contributing factors to the success of Digidrums was that is was relatively simple for Drumulator owners to swap the Digidrums chips in and out of the E-MU Drumulator offering a wide range of sounds from Simmons electronic drum sounds to John Bonham-inspired 'heavy metal' samples. The duo realised that it would only be a matter of time before Drumulator users would want more than just a handful of alternative preset sounds and set to work to find a solution. They identified the potential of the, then recently released Macintosh computer, and started to develop a basic digital audio recording and editing software, initially just for their own use but they soon realised that what had started as a tool to make their own lives easier could be developed in a product for sale on the open market. They changed the company name to Digidesign and continued to develop their Mac-based sample editing system for the E-MU Emulator II keyboard - Sound Designer. 1984 - Sound Designer - The first incarnation of Pro Tools was introduced under the brand name Sound Designer priced at $995, Sound Designer offered visual editing features for instruments like the Synclavier and Fairlight even though at this time sampling was beyond the reach of most consumers and amateur musicians, Digidesign continued to develop versions of the software for each new sampler as they were released, before developing one single application, that that supported hardware from Akai, Roland and E-MU. You can watch this video of Evan Brooks from the NAMM oarl history library, explaining the very early days and the limits that the technology imposed on the development of Sound Tools and then Pro Tools. 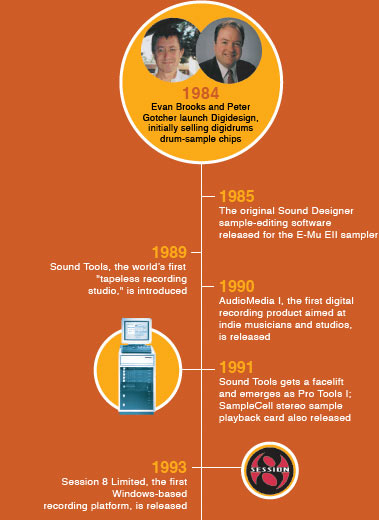 1989 – Sound Tools – On January 20, 1989, Digidesign founders Evan Brooks and Peter Gotcher unveiled Sound Tools, a Mac-based (SE or Mac II) 2-track digital recording/editing system. Offering outboard converters, Sound Designer II software and a $3,995 price tag, Sound Tools was ideal for editing DAT tracks, and its SDII file format became a worldwide standard for digital file exchange until WAV took over some 10 years later. At this stage, Sound Tools was a simple computer-based stereo audio editor. Although the software had the possibility to do far more, it was limited by the hard drive technology, which was used to stream audio and allow for the non-destructive editing that Sound Tools offered. 1989 - DAT I/0 - Digital I/O for the Sound Tools system; Audiomedia I, a cost-effective 2-channel DSP card with analogue I-O. 1991 – Pro Tools 1.0 With Pro DECK/EDIT - On June 5th, 1991, Digidesign made a giant step with its debut of Pro Tools, a Mac-based system that integrated multitrack digital audio recording/editing, DSP and onscreen digital mixing. The core engine technology and much of the user interface was designed by and licensed from a small San Francisco company called OSC, known at the time for creating the first software-based digital multi-track recorder, called DECK, in 1990. That software, manufactured by OSC but distributed by Digidesign, and formed the platform upon which Pro Tools version 1 was built. The platform originally supported four to 16 independent I/O channels, analog and digital I/O and SMPTE sync; 4 voices, ProDECK and ProEDIT software, MIDI, and automation systems and was priced from $5,995 (less the $6,700 for a Mac IIc with4 MB of RAM and an 80MB hard disk). 1992 – Pro Tools 1.1 – support added for up to 4 cards/interfaces for 4–16 voices. 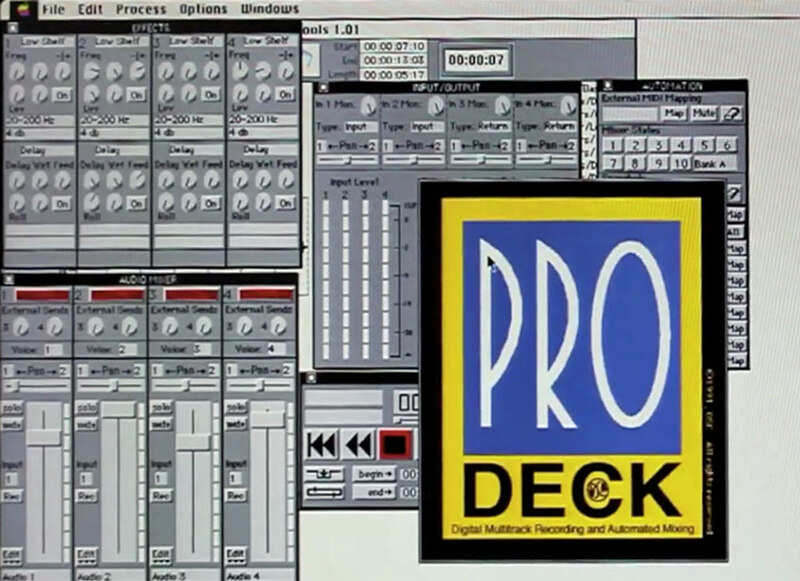 1993 – Pro Tools 2.0 – merged ProDECK and ProEDIT into one application. The Digidesign team had recognised that relying on a third party to develop part of the Pro Tools software was a mistake. Version 2, released early in 1993, brought the software back in-house and introduced the now-familiar Pro Tools application with the DAE. In the next episode of The History Of Pro Tools, we look at how Pro Tools developed from 1994 to 2000.